Midway between Austin and Houston nestled in the rolling hill country of Texas, lies Brenham, the county seat of Washington. Established in 1844, this country town is the perfect place to relax. One of the best parts of Brenham is driving there, especially in the spring. Brenham is the center to several Bluebonnet Trails, the region of country roads devoted to the display of the state flower. Whether traveling along U.S. 290 or the smaller farm to market roads by car or motorcycle, sheets of green fade to a blanket of violet in the untouched landscape paintings of nature. Many make an annual pilgrimage for the perfect family photo. When you walk around downtown Brenham, you walk back in time. The courthouse that sits center stage is surrounded by offices and shops, which sell antiques, apparel, and art. Eateries range from bistros selling delightful sandwiches and soups to cafes with the best pie in town. During the weekend, you will come across many folks walking their dogs or just lounging on the courthouse steps. Brenham’s flourishing historic business center is a result of the town’s participation in the National Trust Main Street Center, a program devoted to the restoration of a downtown’s prosperity. 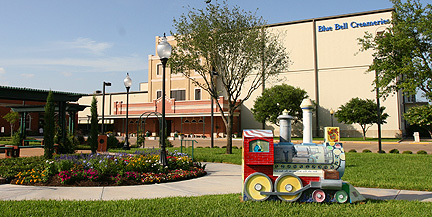 Brenham is home to Blue Bell Creameries, known in the South as having “the best ice cream in the country”. Tours are available during the week, Visitors can buy a souvenir at the gift shop and then stroll outside the creamery with their ice cream snack. Blue Bell, established in 1907, is celebrating its 100th anniversary and has just been granted a Texas Historical Marker in acknowledgment of the creamery’s role in the community. The Blue Bell Aquatic Center across from the creamery offers an indoor pool open all year-round in addition to the outside summer family pool, with equipment for kids. Brenham is dedicated to ensuring that its residents have the opportunity for an active lifestyle. 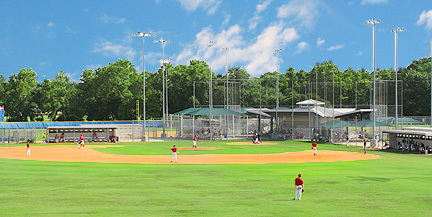 It has several parks dedicated to softball and baseball. Soccer fields are scattered about Holt Park, the largest of the parks. Most are outfitted with barbeque pits, playgrounds, and pavilions. If team sports don’t sound interesting, just walking or jogging around the Blinn College campus or downtown Brenham is incentive enough for a workout. 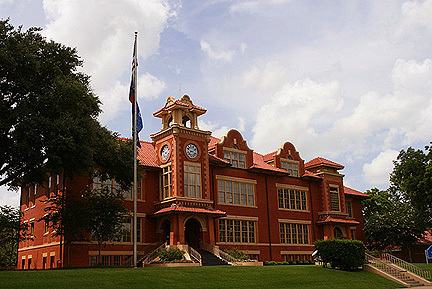 Blinn College, which was founded in 1883 and began as a ministry, has a beautiful campus. The college’s earliest structures blend with the contemporary buildings in a seamless flow. This two-year accredited institution was the first county-owned college district in Texas and has become one of the largest junior colleges in the state. 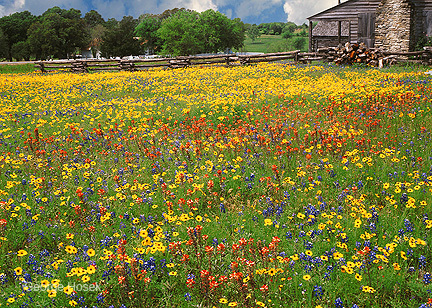 In the spring its all about wildflowers, people from across the country converge on Brenham and Washington County to see bluebonnets, Indian paintbrush, evening primrose and many other kinds of wildflowers blooming along the side of the roads and in the fields and pastures. All the roads around Brenham seem to have wildflowers, but if you feel adventurous you may want to take the back-roads, you never know what you may find over the next hill or around the next bend, this is one time getting lost could be a good thing. Professional and amateur photographers are a common sight in the spring, many people from Houston make the two hour drive to photograph their kids sitting in a field of bluebonnets, or to get unique portraits of their family and friends. 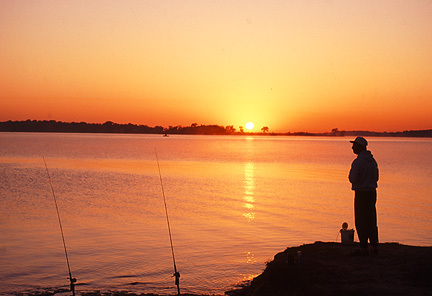 Additionally, about 12 miles north of Brenham, Lake Somerville affords its guests a chance to go fishing, boating, hiking, skiing, camping and just about any kind of recreational activity you can imagine. This 11,630 acre lake has 85 miles of shoreline and contains two state park units, the 2,365 acre Birch Creek located on the north shore and the 3,155 acre Nails Creek located on the south shore on the west end. There is also lake access with public boat ramps, picnic tables, camp sites on the east end of the lake, near the dam. Whether you spend one day or many, Brenham’s laid-back, welcoming charm will entice you to return for years to come. Visit www.BrenhamTexas.com for upcoming events. Brenham Heritage Museum, A classic revival structure built in 1915 is on the National Register of Historic Places. Exhibits include the Elenor Cox Lamp Collection, 100 lamps from 1787 - 1940. World War II artifacts and other items presenting the history of Brenham and Washington County. 979-830-8445 Downtown Brenham's "Main Street" District, come stroll through past and present, visit more than 40 shops and spend time relaxing in the "Wi Fi" hot spot. Brenham's downtown buildings reflect the town's early history and charm. 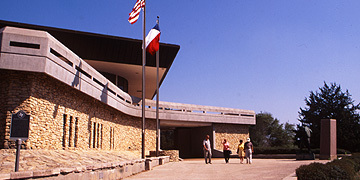 Star of the Republic Museum, the museum preserves and interprets the rich history of the Lone Star State during the Texas Republic period of 1836 - 1846. Barrington Living History Farm, experience the home of Anson Jones, last president of the Republic of Texas. The Brenham Maifest, one of the oldest spring German festivals in the South, will hold its 119th celebration on May 8th - 9th, 2009 at Fireman's Park in Brenham, Texas.